Oreland C. Joe combines smooth contemporary lines with traditional subject matter in his elegant and sublime stone sculptures. Harkening back to the neoclassical masters, Joe's grace, polish and purity of contour bring a heightened level of modernism to the formal aspects of sculpture. His pieces embrace the heart of the subject while conveying its import through the strict rules of form. Joe studied in Italy and brought that language to his Dine (Navajo)/ Ute upbringing, interweaving the seemingly different cultures into one fluid movement in stone, using Old World European techniques to carve Native American images. Leaning toward marble, he softens and smoothes, balancing the textures with iconic values. 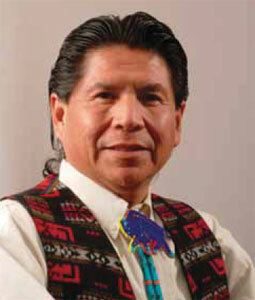 He is constantly inspired by his native land and culture and by the ceremonial aspects of living in New Mexico. Oreland Joe, First Mesa Maidens, Tennessee Marble, 31.5" x 12.5" x 8.5"
In 1993, Joe received the distinct honor of becoming the first Native American artist to be a member of the Cowboy Artists of America. In 1996, he was chosen out of 50 artists by the Ponca City Native American Foundation to produce a 22-foot bronze sculpture of Chief Standing Bear. Since then his work has appeared in Prix de West, National Cowboy and Western Heritage Museum, Oklahoma City, Oklahoma; Arizona: A Millennium of Arizona Art, Medicine Man Gallery, Tucson, Arizona; Masters of the West, Autry National Center, Los Angeles, California; Indian Artists of America Show, Scottsdale Center for the Arts, Scottsdale, Arizona; Cowboy Artists of America Roundup, Cowboy Artists of America Museum, Kerrville, Texas; and others. His work is exhibited at the Mark Sublette Medicine Man Gallery, in Tucson, Arizona, and Santa Fe, New Mexico. 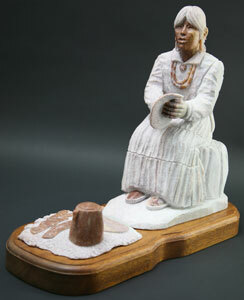 Oreland Joe, Evening at Grandma's, Utah Alabaster, 18" x 21.5" x 8"